A Data Record asset is an asset without any default purpose. It allows you to decide what to use it for through a Metadata Schema. You can build a schema with the required fields, apply it to the Data Record and display the metadata through other assets in Squiz Matrix, for example an Asset Listing. A Data Record is like a Standard Page but without the Edit Contents screen – in other words it does not have any content. Once you have created a Data Record, you can configure the asset on its associated screens. As the Data Record has no default purpose, all of these screens are the same or similar to those for a Standard Page and are described in the Asset Screens manual. In this chapter we will only describe how to use the Data Record. To understand how the Data Record works consider the following example. We need to create a list of books contained in our library. We only want to store and show the name, description, author and subject for each book. As there is no content for the books we can use the Data Record. We also need to create a Metadata Schema to store the information about the book and an Asset Listing to display the list of books. 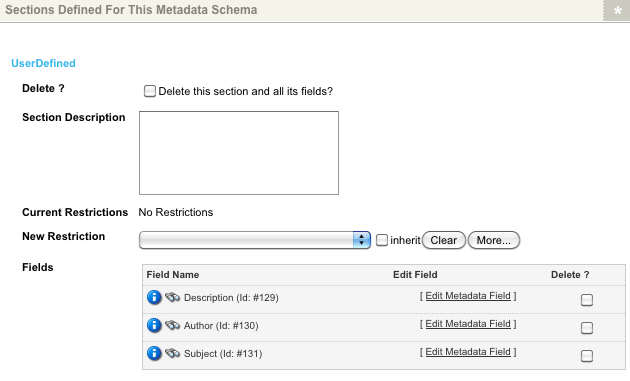 Create a Metadata Schema with the fields Description, Author and Subject. The Description and Author fields are of type Text and the Subject field is of type Select. The values in the list for the Subject are Squiz, Squiz Matrix and Training. Once you have built the schema, the Sections Defined For This Metadata Schema section on the Details screen should look similar to that shown in the figure below. 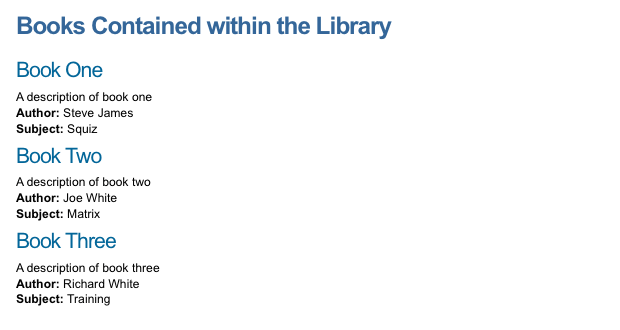 A Data Record needs to be created for each book within the library, the Metadata Schema applied and filled out. Create a Folder called Books and apply the Metadata Schema. Create each Data Record under the Books folder and fill out the metadata fields on the Metadata screen, as shown in the figure below. Asset Types to List: select Data Record. This will only show the Data Records that appear under the Books folder. Root Nodes: select the Books folder as the Root Node for the Asset Listing. On the Page Contents Bodycopy for the Asset Listing, specify a title for the page and the keyword replacement on the Edit Contents screen, as shown in the figure below. For each Data Record we want to show the name of the asset, description, author and subject. Edit the contents of the Default Format Bodycopy and enter the required keyword replacement. These keywords will depend on what the field names are in the Metadata Schema. An example of this is shown in the figure below. When you preview the Asset Listing, for each Data Record under the Books folder it will show the name of the asset, description, author and subject, as shown in the figure below.